Need a place to donate your purged closet items? GHM in SW PDX welcomes them. Looking for a boutique experience at thrift store prices? Put GHM on your list. What a delightful little place. Clean, bright, odor-free (no stinky floral potpourri) and well-organized, tastefully displayed merchandise. It helps that the shop formerly housed a frame gallery and provides lots of natural lighting. It also helps that the young manager knows her stuff and has an artistic flair for fashion. All the clothing is sized and arranged by color. Everything from shoes to handbags to jeans is in excellent condition and priced to sell. Tanya greets customers with a warm smile and eagerly shares the story of the shop and its mission. All the items are donated with donors receiving a 20% discount off their purchase as a special thank you along with a tax receipt. The shop also has great half-off sales on a regular basis. (I snagged a stylish bustier by My Boyfriend’s Back for just $12.50.) Donate your gently used clothing and accessories (men’s apparel, too) directly at the store located at 4711 SW Beaverton Hillsdale Hwy, PDX 97221. 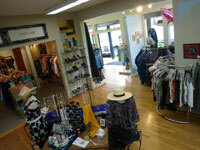 Store hours are Tues-Fri 10 to 5 and Sat 10 to 4. Phone: 503-265-8613. (The shop is tucked down a slope and hard to see from the road. Watch for the pink and white sign on the north side of the road.) Visit the GHM Facebook page. Note: Donations that are not accepted for the boutique are transferred to other metro area agencies including Dress for Success and Blanchet House. GHM stands for Gung Ho Ministries, a non-profit with a focus on transitional housing for homeless vets in the metro area. They currently provide food, toiletries and spiritual support to the homeless and working poor “Under the Bridge” near Old Town. Visit the website to learn more.